A Cardboard Problem: I smashed the retail odds to bits. It should be assumed from this day forward that if I have left my house, I have probably returned with some baseball cards of some sort- trade, Target, eBay, etc. Well this time (and most other times) it was a Target kind of day. Over the past two days I have opened an embarrassing number of retail packs simply because I have been having fun with them and getting some decent hits. I am not going to shout myself out here by saying how many but it was more than 10 packs, less than 25 and more fun than the stupid box of Unique which I will grumble, snarl, and complain about later once I am over it. 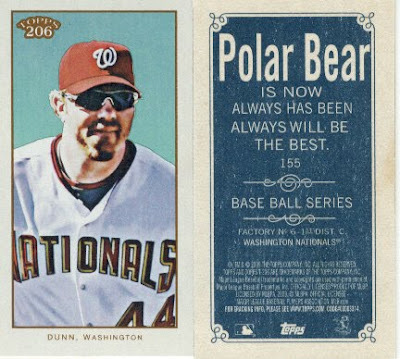 In the meantime you can continue to view my ridiculous obsession with Topps T206. I bought a heap of packs, and I was going to ration them so spread the fun out so I started with 6 packs. In the first 6 packs I got 2 crazy cards, defying all odds of retail and my own personal luck. And holy schnikeys!! Albert Pujols Old Mill game used jersey. Which I had to do a triple take to make sure I was really seeing what I was seeing. I was smiling and practically dancing after opening this. 9:16 PM i opened 2 more packs. me: you really want to open air on your bday? what if there's a nno pujols? fine. i shall keep them. 9:18 PM you write your blog? Marie: no ive been studying the spinal cord"
Did I really think anything was in those last packs? Absolutely not, but I am a sucker for taking a chance on luck. Here is what was in the rest of the packs, I am only showing the hits and the mini's from all packs opened. Really?!!!! What in the name of Pete happened here?! Unreal. I seriously should just stop buying these now because it is not going to get any better than this. Talk about a crazy prediction by Flash. 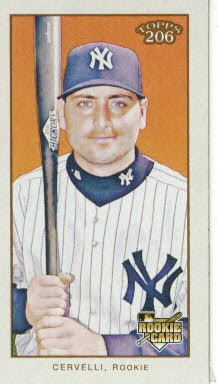 Mini Polar Bear Cervelli. Go Italy. For anyone debating on buying hobby packs, don't bother it really didn't make any difference in either my or Sooz's pack breaks. I may have very close to a complete set of these cards, and I thought about going for it but since I am still 29 cards short of my OPC venture and like 6,000 short on YSL I can't take on anything else. I love T206 and retract any former complaints. 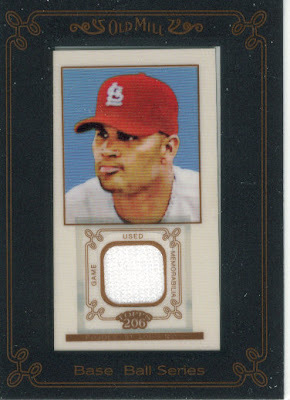 I love my Albert Pujols Old Mill game used jersey that was pulled from a RETAIL pack at Target. Take that "stated odds". Very nice, this isn't a huge surprise on the retail of this product in my opinion, the original Mayo football had the same situation. 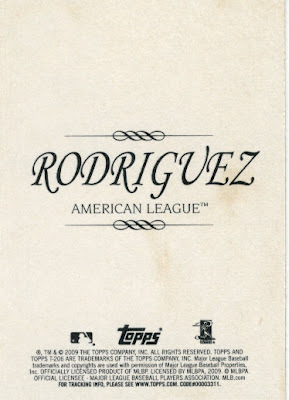 Glad to see Topps throws retail a bone once or twice a year! Nice!!! 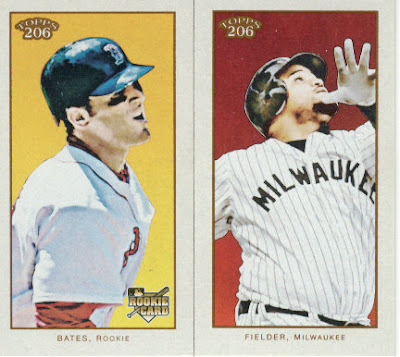 I'm not sure how I feel about the base set T206, but I LOVE the look of the relics. Good to know that retail is a viable option with this one. It is safe to say that you have had a very good week then...awesome retail pulls! 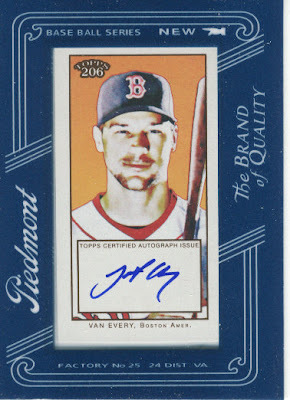 The Topps 206 arrived this week at the Concord, NH. While you're write-up made it very tempting... 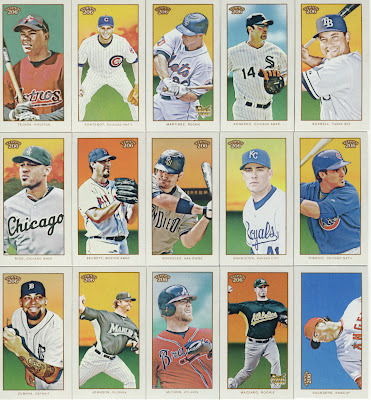 I'm not going to start collecting MLB until spring, and that style is not my cup of tea. I wish my Target had something newer than Updates & Highlights. Actually, no I don't... I already have too many cards lying around that I haven't sorted and put away. An Albert Old Mill relic out of retail! Old Mill relics are 1 out of 1,1010 packs! Nice pull! 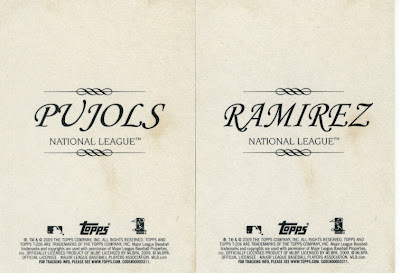 I have a page started for Topps 206 with a complete NNO SP list if anyone is interested.